This extremely appealing c.1932 art deco style pocket map of Paris France by Robelin, combines the virtues of a map and a view. Designed with the tourist in mind, this map covers the embastilled center of Paris and its immediate vicinity. It reflects the transformation and modernization of Paris under Napoleon III and Georges-eugene Haussmann. Paris proper is colored in appealing pastels and exhibits more 'map-like' qualities in the layout of the streets, trains, and bridges. The various suburban communities surrounding the center and important buildings, including the Eiffel Tower, the Arc de Triomphe, Sacre-Coeur, the Pantheon, and others are shown in profile. Major streets, subway lines and tram lines are also noted. Though undated we can assign an approximate date due to the development of the subway system and the map's overall style and construction. 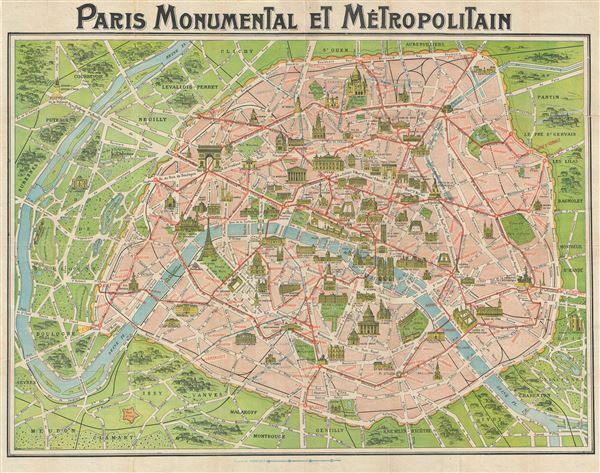 An altogether marvelous decorative map, one of the more desirable of the 'Paris Monumental' series. Accompanied by the original art nouveau style red binder and accompanying guide, featuring 12 pages of texts with guides to museums, libraries, and other points of interest in French, English and German. Prepared by Robelin.